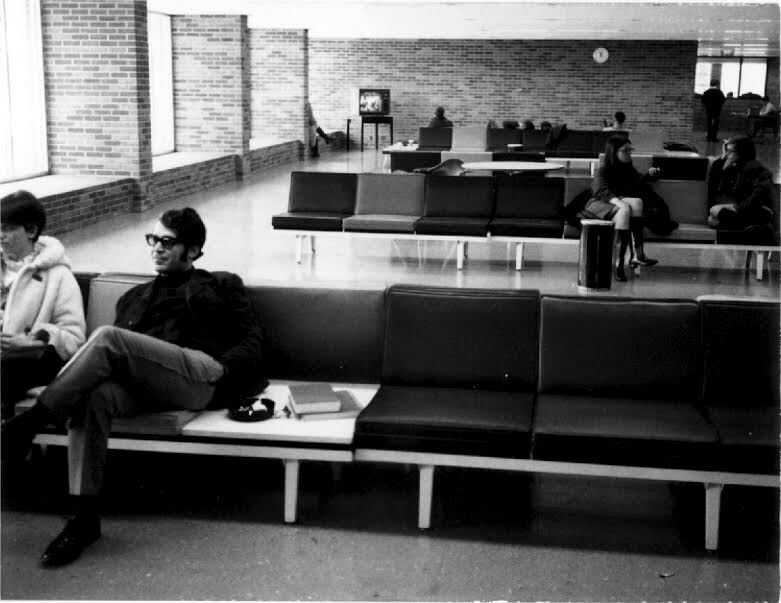 Many of Hillsdale College’s alumni came to school when the student union was basi­cally an airport. A few rows of metal chairs and a modest-sized TV lined the hallway that now con­tains the com­puter lab, next to a smoke-filled snack bar. 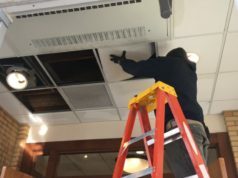 A ren­o­vation in the 1980s earned the student center’s glo­rified hallway status as the “Ethan Allen Room,” but the improve­ments paled in com­parison with the college’s massive 2008 upgrade: the Grewcock Student Union. The Grewcock Student Union was ded­i­cated 10 years ago, in January of 2008, thanks to the gen­erous donation of Nebraska natives Bill and Berniece Grewcock. It replaced the Knorr Student Center as a place for stu­dents to con­gregate, eat meals, play ping-pong, study, or chat. While the old student union cer­tainly had a char­acter some might remember with nos­talgia, the Grewcock is, to many alumni, a lux­u­rious upgrade. Pro­fessor of History Mark Kalthoff ’84 attended the college in the Knorr student center’s earlier “grey­hound bus depot” stage. He returned after the late 80s ren­o­vation to teach at the college, when the old fur­niture was replaced with some nice sofas and wing-like chairs, and Kalthoff may be part of the reason why the place even­tually became known among stu­dents as the “EAR,” short for Ethan Allen Room. “I remember walking in one day saying, ‘Wow, this looks like an Ethan Allen fur­niture show room,’ and before long, people just started calling it the Ethan Allen Room,” Kalthoff said. In order to build the Grewcock Student Union, the college tore down the Carr Library, which had been built in 1951 and was replaced by Mossey Library, which was con­structed in 1971. Pro­fessor of Phi­losophy Lee Cole said it took him a while to get used to the changes, including the chairs, video games, etc. when he came back to campus to teach. 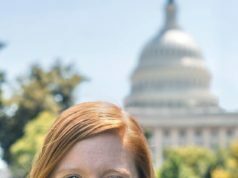 “When I came back and saw the Grewcock for the first time — frankly the second time and the third time too — I expressed the sen­timent that I’m pretty sure was uni­ver­sally held by all my peers from Hillsdale, and that is, our stu­dents are really really spoiled now,” Cole said. Lindley noted that the space was overall much smaller than the Grewcock Student Union and gave the envi­ronment a dif­ferent feel. “You couldn’t be anonymous in the old student union couch area,” Lindley said. Besides the EAR, the Knorr also fea­tured a snack bar, now referred to as the “Old Snack Bar,” where stu­dents could pur­chase treats like burgers and fries or a milk­shake. It wasn’t fre­quented nearly as often A.J.’s, according to Cole, and often it was seen as more of a special treat, whereas people now use A.J.’s fre­quently. Some stu­dents also took advantage of the allowance to smoke in the snack bar area. Pro­fessor of English Christopher Busch remembers buying many chocolate milk­shakes at the snack bar. He also noted that there was a cig­a­rette vending machine located outside the door and little ash trays lining the walls of the classroom buildings. “I had come from Cal­i­fornia where smoking was kind of not encouraged even at that time, so that was kind of sur­prising, because even from my childhood smoking was more prevalent than later on,” he said. The Fair­field Society was also “very much a staple” at the time, according to Cole. The group would hold weekly meetings in one of the Knorr Center rooms next to the snack bar. Usually the pre­sen­ta­tions were on reli­gious or the­o­logical topics, which were delivered by either a student or pro­fessor, and usually attracted around 15 to 40 stu­dents. Members would often bring their trays from the dining hall to eat during the 90-minute pre­sen­tation. “You were allowed to have trays — that’s the only way the college was better then,” Cole said. Lindley also noted that it was a lot easier for stu­dents to sneak out food items from the dining hall, some­times packing their entire dinner so they wouldn’t have to come back later that day. An addi­tional perk for some stu­dents was the bowling alley that was later replaced in the basement of the Knorr Center. The Col­legian and Student Activ­ities Board also got new offices with the tran­sition. Assistant Dean of Women Rebekah Dell, who directed the Student Activ­ities Board from the summer of 2006 to the summer of 2010, said SAB has seen “dra­matic growth” since its move to the Grewcock from a couple of small offices in the Knorr Center. Not only has the student and adult staff doubled, but SAB now hosts a wide variety of events throughout the year, in con­trast with the seven major events it used to do. Lindley likened the dining hall in the old student union to a 70s-style country club, with its large glass floor-to-ceiling sheet windows. The old dining hall was gen­erally more crowded at meal times than the one in the Grewcock is, which meant stu­dents would often have to sit with people they didn’t nec­es­sarily know, and pro­fessors were more likely to sit together with stu­dents instead of sep­a­rated at their own table. 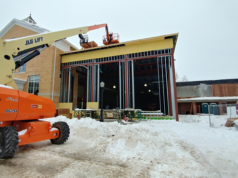 Jill Smith, who started working in the old student center dining hall in 1995 and is cur­rently employed by Bon Appétit, said she still remembers what it was like watching the Grewcock center being built. A lot of college cam­puses began updating their student unions, according to Kalthoff after the Baby Boomer gen­er­ation, of which he was a part, had grad­uated. The smaller class sizes in sub­se­quent gen­er­a­tions caused more com­pe­tition for stu­dents and led to a lot of improved campus amenities. Previous articleHow important is this election, really? Yes indeed…we smoked and we drank inside the union. There were days when Hillsdale was rightly called Hap­pydale for good reasons. Several notable campus parties, replete with suitable bev­erages, were held there. Never mind a few noto­rious “con­certs” inside the gym…whamerjammer anyone? And oh heck yes…the bowling alley and pool tables…tournaments and teams…frisbees outside on the lawn where now that god awful temple to false gods of money and power is being built. Yes..there were days and times on the campus that went beyond pol­itics and religion…alas those days are gone…but the mem­ories remain! yeah… the snack bar was a good place to go sit and burn one down. The old EAR was where lots of fundy types would go to do excessive PDA during day­light hours. Not sure if this is still the case in the new areas.